As an archer, I have a special appreciation for badass weapons involving arrows. Even if you're more of a gun person and have zero background shooting a bow and arrow, there's no way you won't love this over-the-top contraption. YouTuber JoergSprave has a talent for being able to weaponize pretty much anything, including pop bottles. One man's trash is another man's treasure, right? Anyways, like any good shooter, Jörg was not content with having just one bottle rocket. Instead, he decided to take it several steps further with a full on revolver, dubbed "The Coke Bottle Gatling Gun." Most people are satisfied with a good old-fashioned bow. Maybe a compound or crossbow if they're really itching for excitement. After his first attempt using a 50 oz. bottle, it was time to ramp it up. The bigger bottle couldn't take as much pressure as a smaller, personal-sized Coke bottle, and it took longer to pump. Using a smaller bottle gives the weapon more punch. No, Jörg took it to the next level entirely. 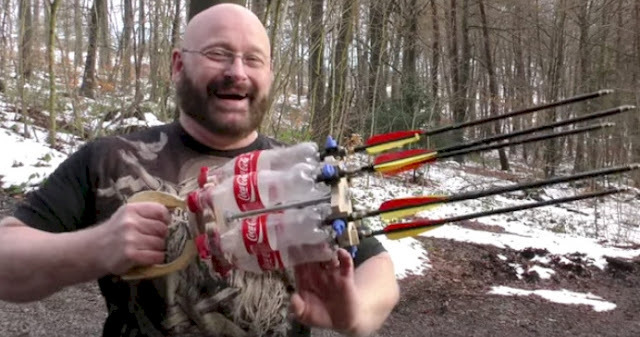 Fusing together six Coke bottles, he created a manual Coke bottle revolver. If it sounds like something straight out of your nightmares, that's because it is. And it works like a freaking charm. Check out the full video to see how he made it! Be warned though, this is NOT meant to be a DIY, so don't try this one at home.